While it is easy to enjoy a nice meal with a sleeping baby, once that sleeping baby awakens things change. Months later the previously sleeping baby turns into an active monkey who can enjoy real food. The challenge becomes being able to feed the happy active baby while also eating something yourself. For the longest time, my husband, Tony and I would take turns appeasing CJ. Then, we appeased hungry monkey by putting him on the table in a Bumbo. It worked for about two months. Now he can bust out of the Bumbo, but he still wants to be part of the action. The quandary became how to entertain CJ while also enjoying a meal. After loads of trial and error, pulled tablecloths, spilled glasses, and plates tossed on the floor, I finally figured it out. I followed his cue – and stopped feeding CJ off of a plate. I discovered something heavy and bulky to put in its stead. A cutting board! 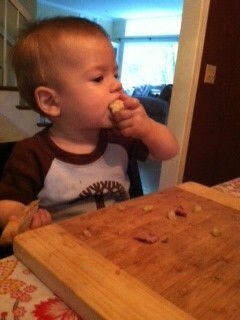 After all, a wooden cutting board is too heavy for him to toss on the floor or otherwise mess with. It goes right on the tablecloth and acts like an anchor for his food. CJ feels like a part of the family dinner (and eats more too). Now, we can literally dine together without worrying about dishes being dropped on the floor or tablecloths being pulled from their place. At least not CJ doing that, my 3 year old is another story. This entry was posted in eagle mom, food, infant, tips and tagged babyfood, children, cultivating baby manners, cultivating baby's tastes, infants on September 26, 2012 by Modern Mama.